Kimberly shares her love for plant-based food in her blog The Little Plantation. 1. Peel and slice the bananas. Place in a food bag and freeze overnight. 2. To make ice cream, put the frozen bananas in a food processor or blender together with the peanut butter; blend until smooth. Spoon into a freezeproof container and freeze for 30-60 minutes, or until firm. 3. Meanwhile, place the hulled strawberries into a jug or container and purée with a stick blender until smooth. 4. 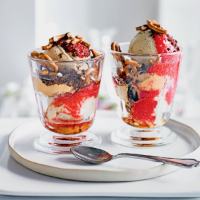 When ready to serve, layer scoops of banana ice cream into 2 sundae glasses, with the strawberry purée, extra peanut butter, crushed pretzels, chocolate (or cacao nibs) and maple syrup. Top with the extra strawberries and serve immediately.